Want to make God laugh? Make plans! Today, we woke up with plans set for the whole day. There is a saying: “Want to make God laugh? Make plans.” Well, this was our experience today. 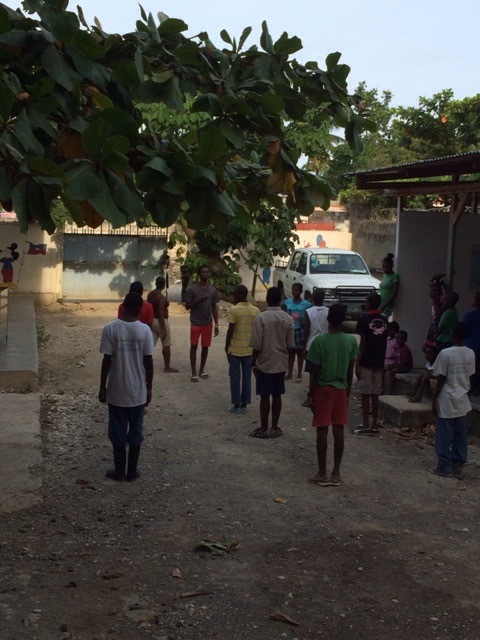 We had much to do and had many things on which to work; for instance, instead of our Creole class, we needed to work with our teacher on our First Penance service in Creole. After that, we needed to bake banana bread for a meeting we were having in the afternoon with the Mother Angela Clinic team. 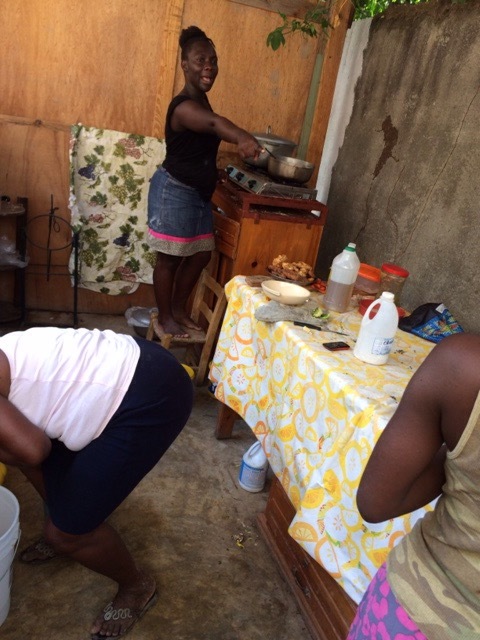 Sr. Marilyn needed to drive one of our boys to take an entrance exam for school, and Sr. Inga needed to show one of the girls we are helping earn money for school what to do in some cleaning. Then we had a knock at the door. Two of our little guys came because their mother went to the river to wash clothes. We did not want to have them come because we were so busy. But God had other plans for our day! We gave one of the boys some cornflakes, and he went out to play. 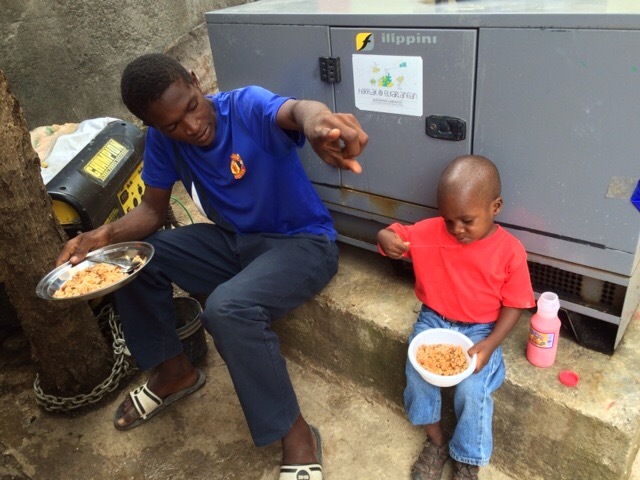 The youngest boy, Jolandez, who is three years old, seemed sad and was very tired. Right away, he wanted to be picked up, and he fell sound asleep. When he woke up, we noticed he was very warm and his eyes were glassy. We decided to take his temperature. Sure enough, it was high. 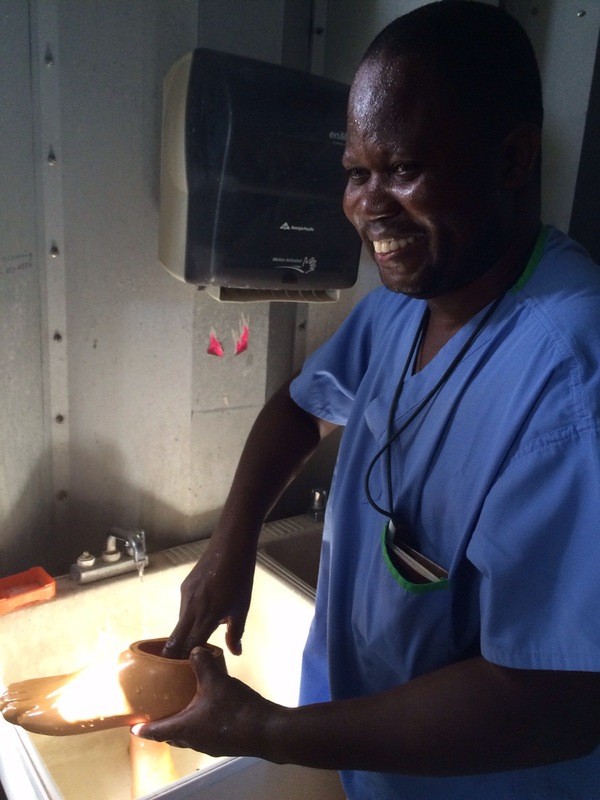 Thank God, Dr. Wanitha from our clinic team was in the pharmacy. She took a look at him and said he was very sick. 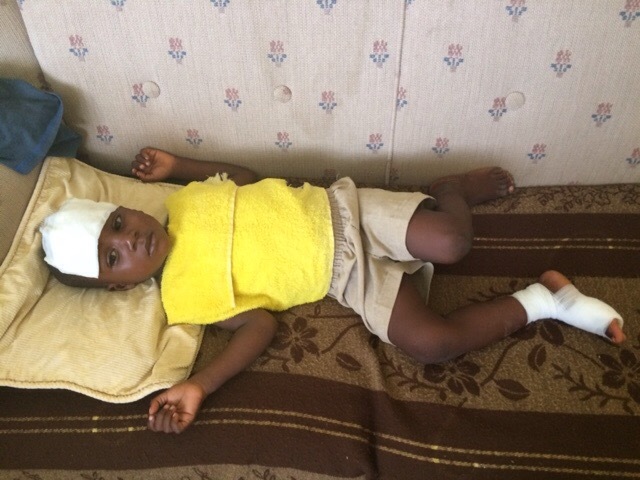 Jolandez had an infection in his foot, which he got last week when he accidently stepped on hot charcoals that the family used for cooking. 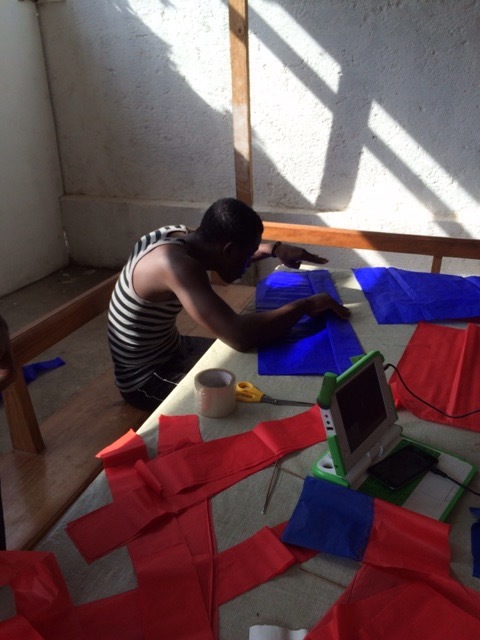 We could not contact his mother, so we did the best we could with medication, cold compresses, and a safe place for him to sleep. This was a good lesson for us that anything can happen with a knock at the door. We need to let go of what we think is important and do what is needed. Maybe this is what the ministry of presence is all about. 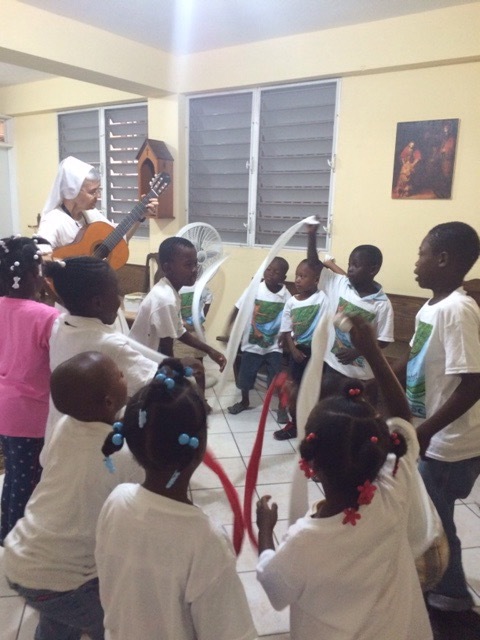 During these days, we have been very focused on preparing our young people to receive their First Penance and Holy Communion. 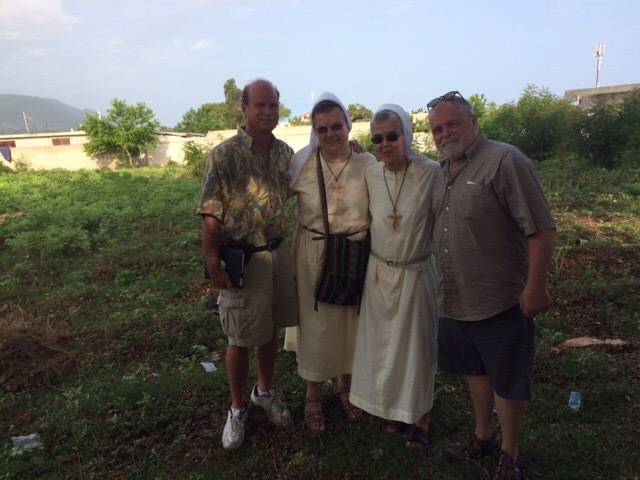 They have been meeting a few times a week, learning the scriptures and teachings of the Church. They will finish this intense time with a three-day retreat, during which they will receive for the first time the Sacrament of Reconciliation. After that, they will recieve their First Holy Communion. All this will take place next week, June 4-6. We thank Fr. 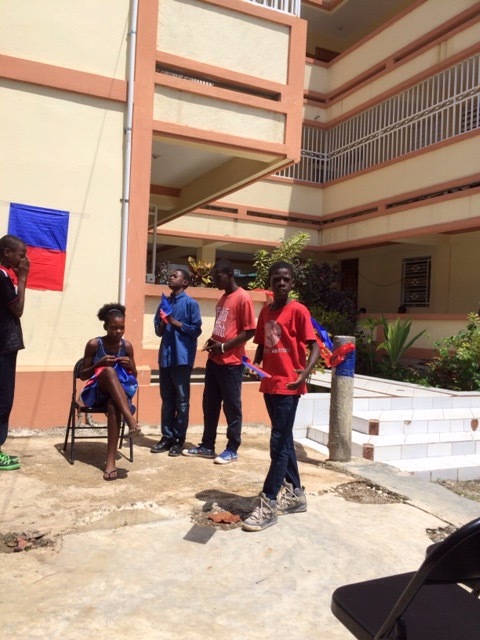 Elicien, Madam Omanie, and James Pierre for their assistance in preparing our young people. James, is hoping to enter the seminary next September. 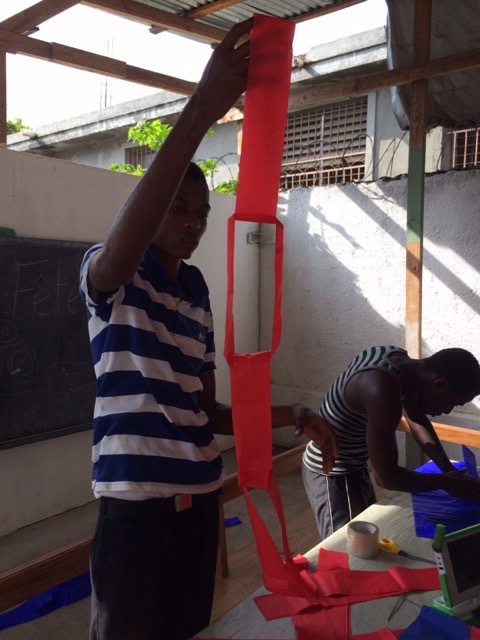 He has been working with our young people for the past two years. Thursday is catechesis day here in the Felician Mission. 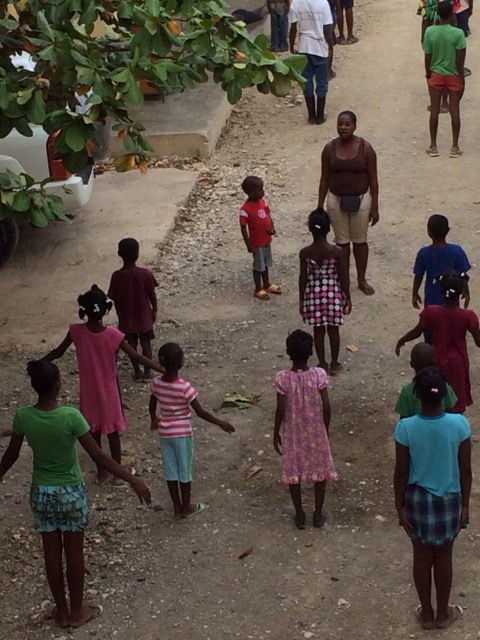 We now have 14 young children in our program, ranging from 6-10 years old. Today we had the story of Bartimeas, the man born blind. First we read the story from Mark 10: 46-52. 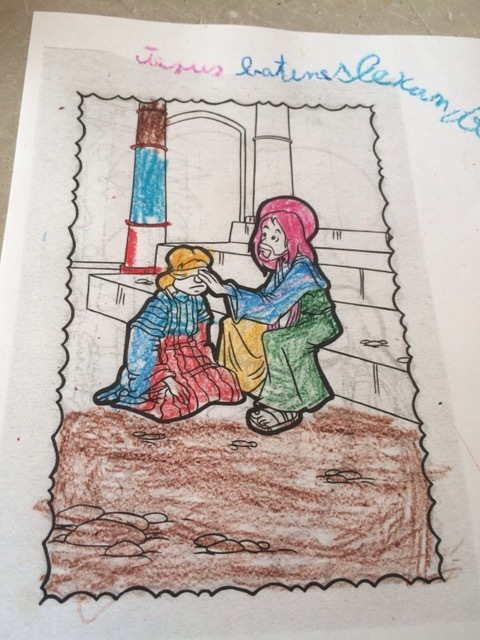 Then the children shared what they heard and colored a picture of the story. 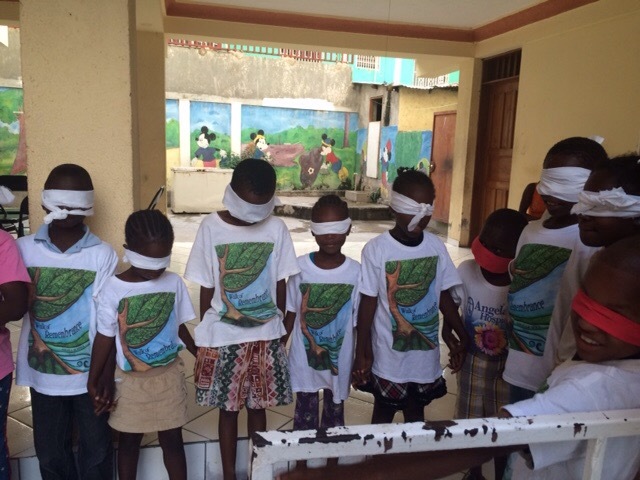 They even had an experience of what it might be like if they were unable to see. 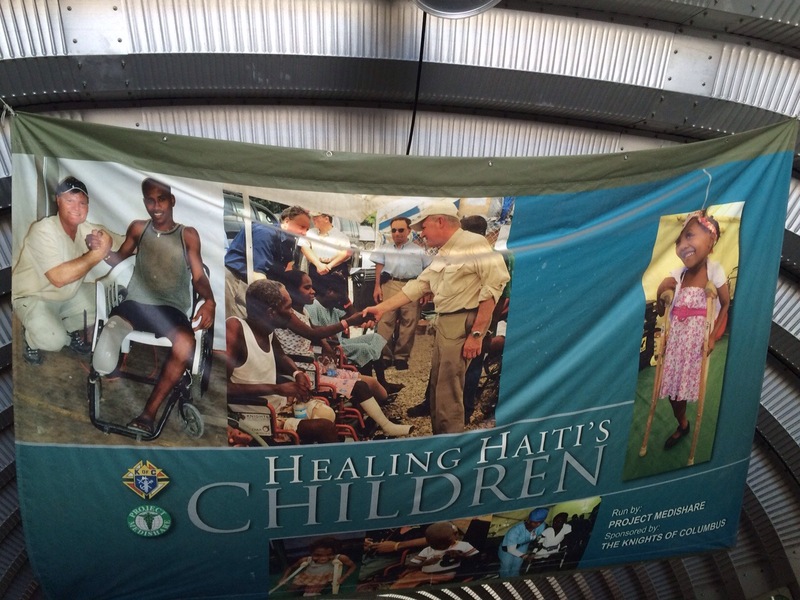 We prayed to be able to see Jesus in everyone and prayed for healing for those who are sick and suffering. At the end of the session, we always give thanks and praise to God in song. 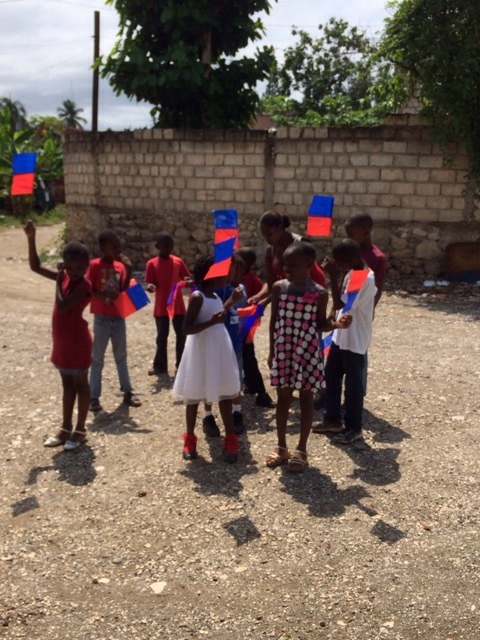 The Haitian flag has long been a symbol of pride for Haiti. 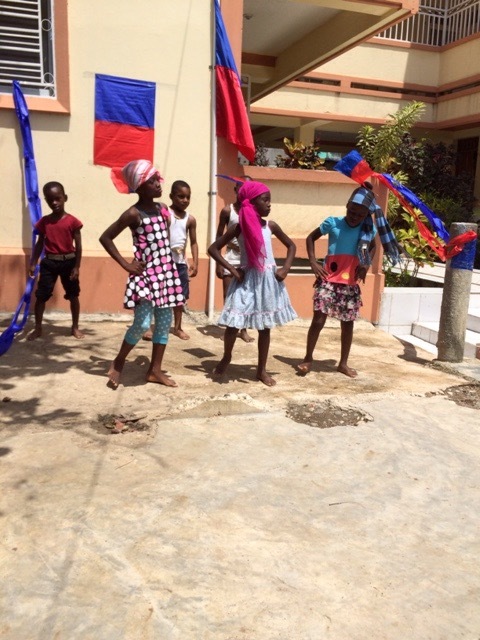 Haitian Flag Day, which was celebrated today, May 18, was all about pride in the culture and heritage of the people symbolized in the Haitian flag. 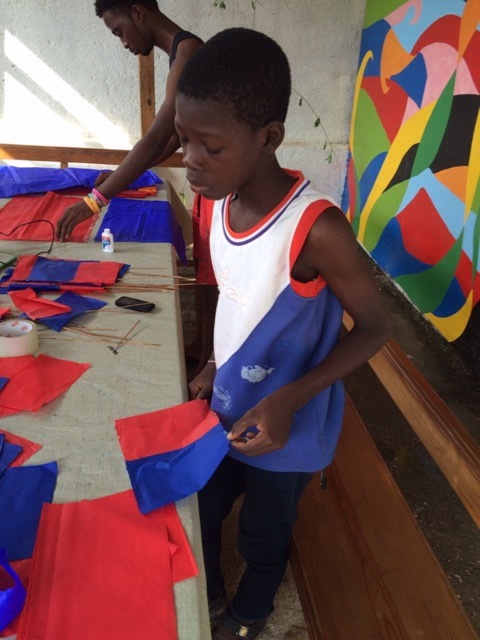 Emblazoned with the country’s coat of arms and the colors red and blue, the Haitian flag was adopted from the French flag. 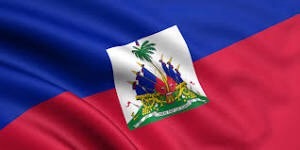 Haiti gained its independence from colonial rule in 1804, making it the first country in Latin America and the Caribbean to do so, and the second republic to defeat a European colonial power in the Americas. 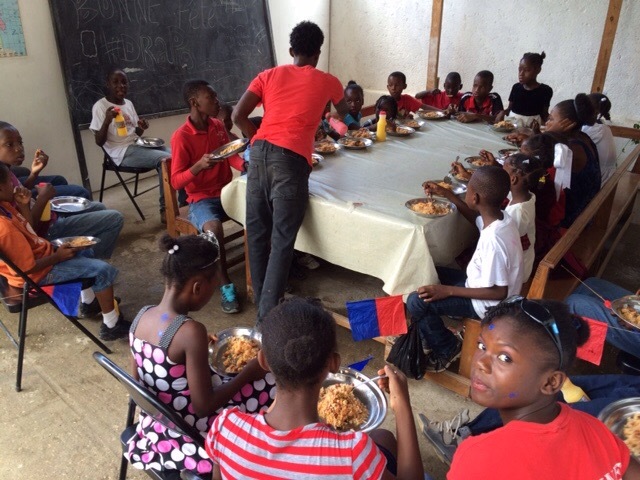 Some of our teens wanted to have a program to celebrate Flag Day with our younger kids. So, last week they wrote their plan and presented it to us. 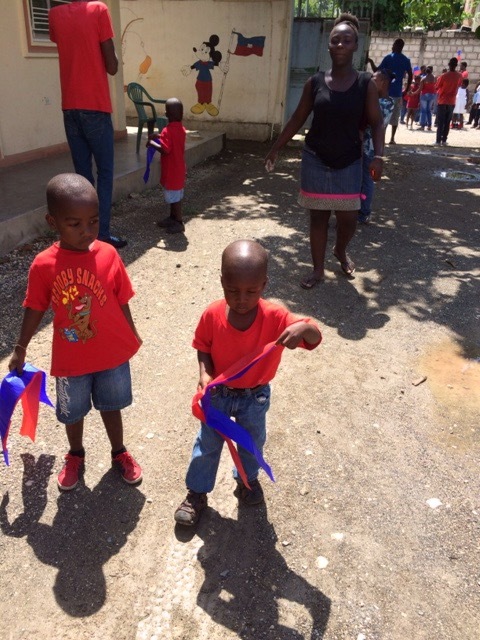 They had practice with the kids everyday–marching, singing the national anthem, dancing, and a preparing a skit about the flag. And, of course, we would need to have food! 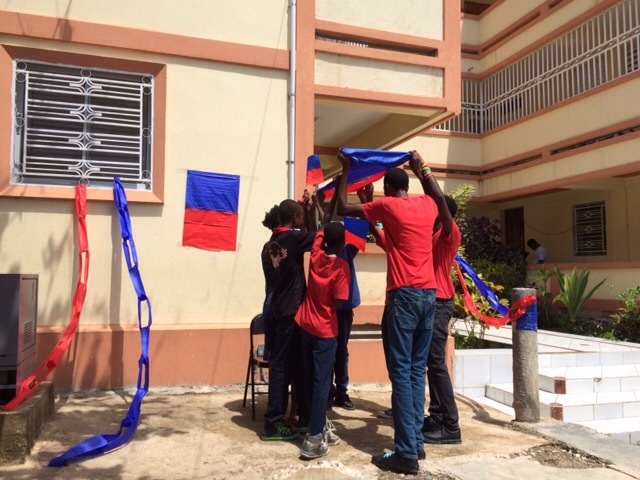 When the day arrived, there were some last-minute preparations to be done, like making flags, decorating and, of course, hanging the flag. 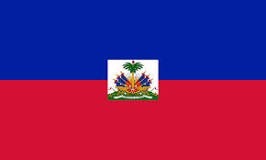 The Haitian flag, as it’s known today, first came into use in 1806. 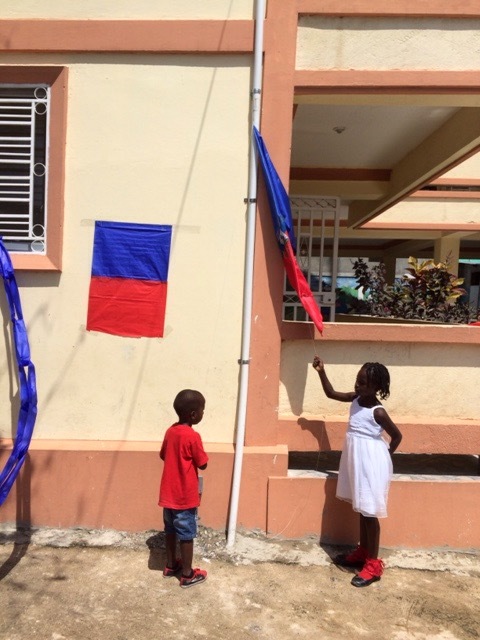 The story behind the flag’s red-and-blue backdrop is that Jean-Jacques Dessalines, a leader in the Haitian Revolution against France, removed the white in the French flag to symbolize an end to white Eupropean influence. 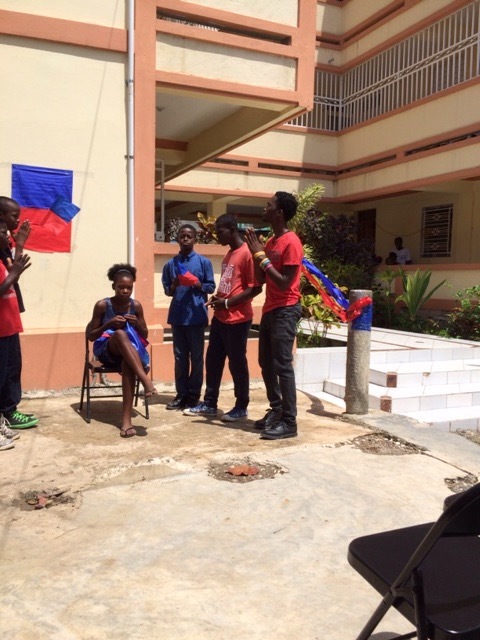 The blue is said to represent the former African slaves who were brought to Haiti by the country’s colonial rulers. The red stands for people of mixed ancestry. 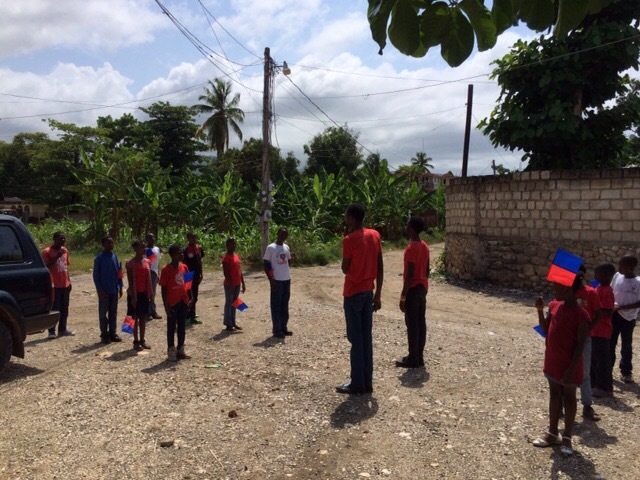 The kids and teens entered our compound marching to the music of the national anthem with great pride. 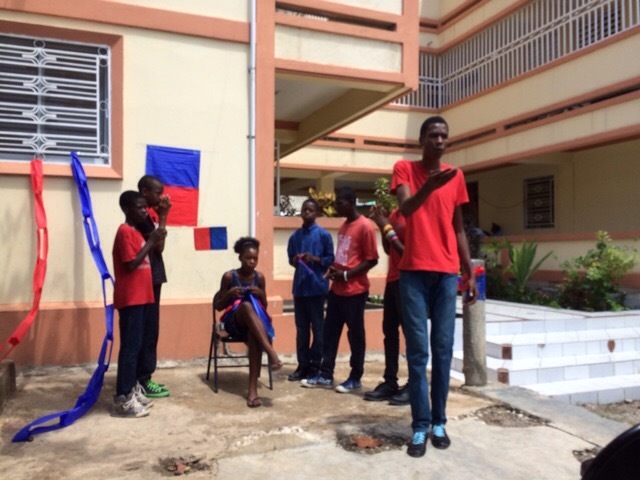 They then sang the anthem and had a special ceremony raising the flag. 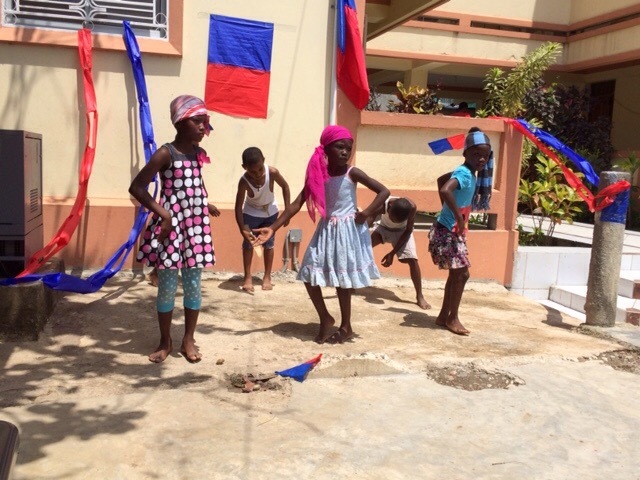 Then the younger kids had prepared a traditional dance that told the story of Haiti’s enslavement and their fight for freedom. 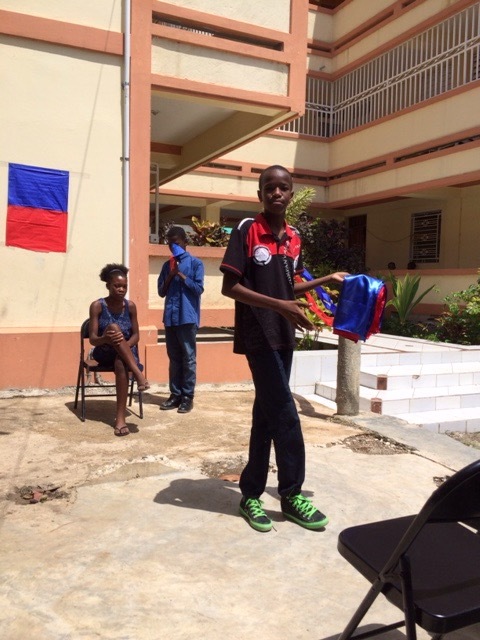 Next a skit was presented telling the story of how and why the flag was created. 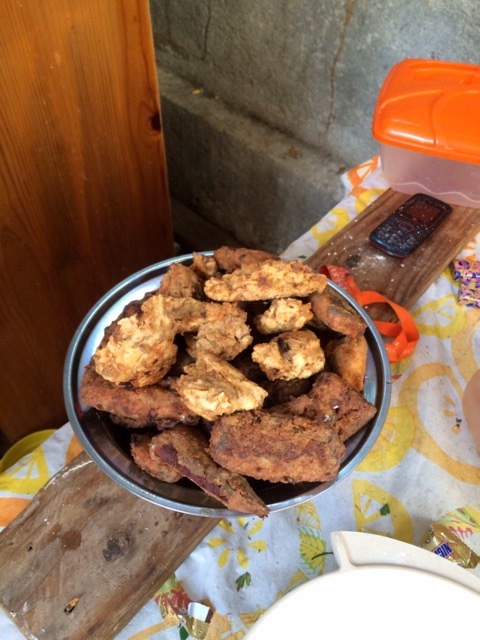 After the program, it was time for some sweets, as well as fish, rice and beans, and a sweet drink called Tampico. 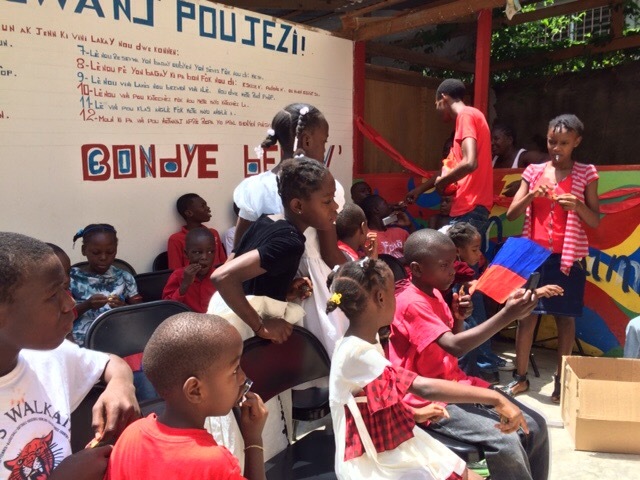 The flag of Haiti is a bicolour flag, featuring two horizonal bands coloured blue and red, defaced by a white panel bearing the coat of arms. Unity and strength was truly experienced today as we celebrated this day together. 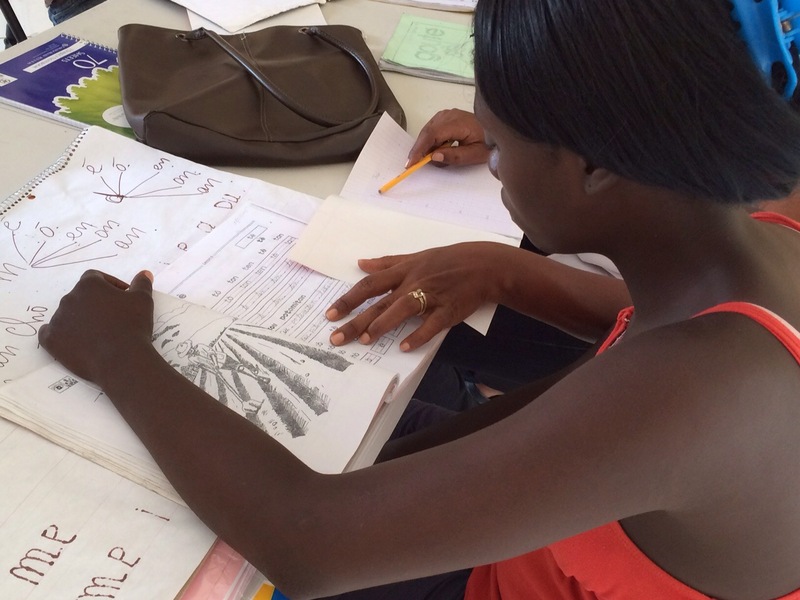 An awakening: learning to read and write! The ladies in our neighborhood who are participating in our learning to read and write class are beginning to understand what this proverb means for them. 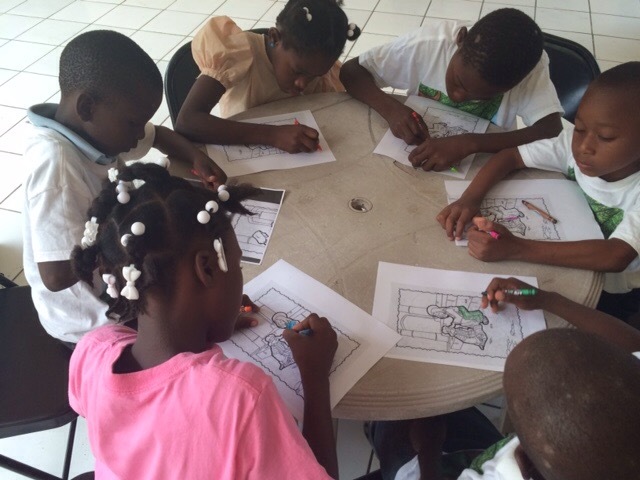 For the past 2 1/2 months, they have been faithfully participating in these classes. 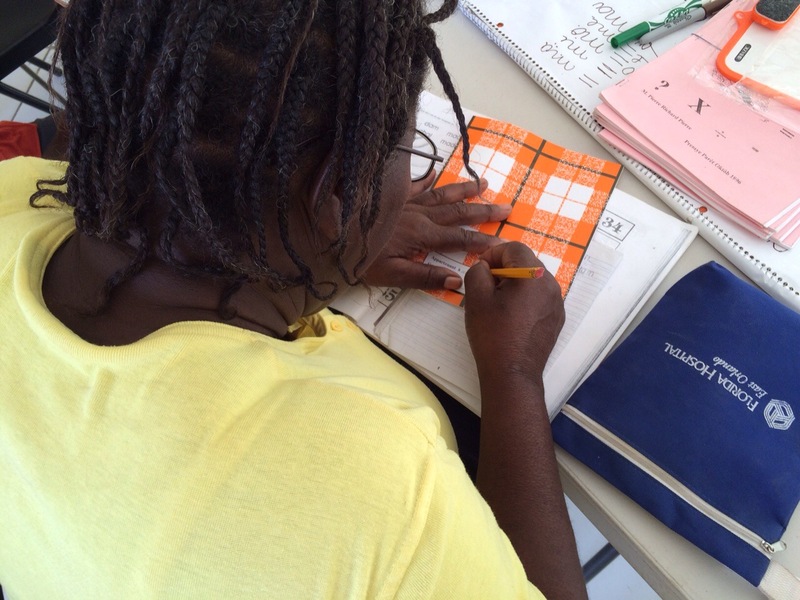 It is a joy for them now to be able to write their own names on their new notebooks and on documents. One of our ladies had trouble writing at first. She was putting her nose so close to the paper that we realized she could not see. Thank God for Walgreen’s reading glasses! Now she can see! 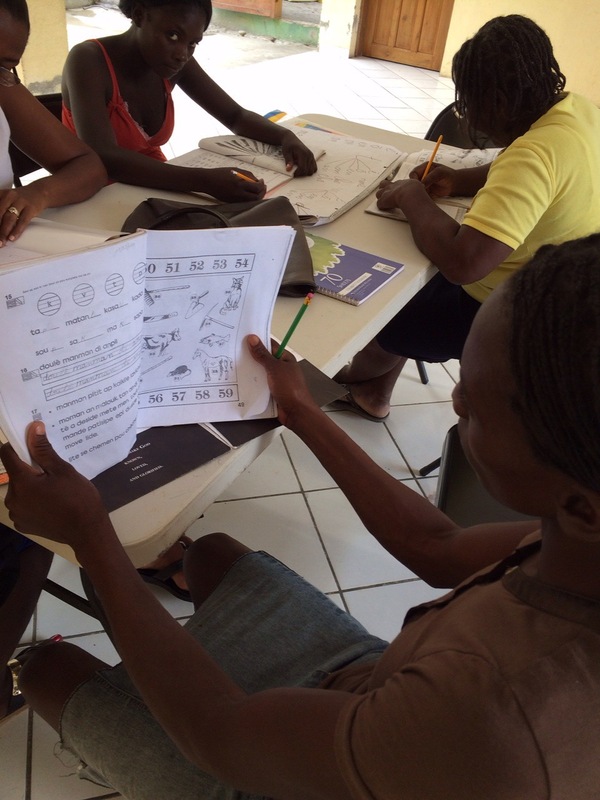 These women are so happy that slowly but surely they are now able to read and to comprehend some simple phrases. 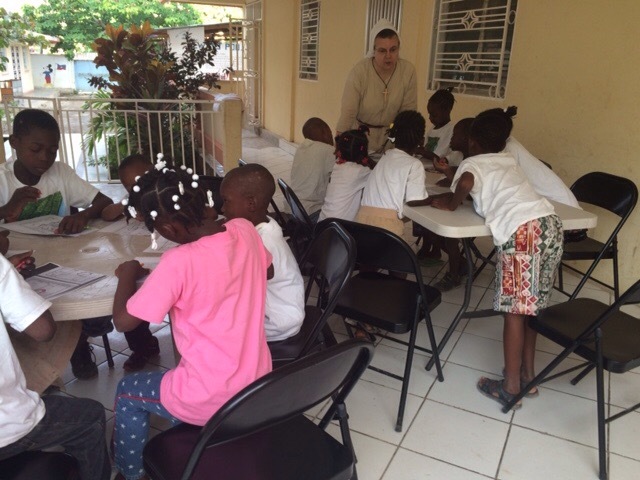 We are grateful for this new program and pray to continue it. 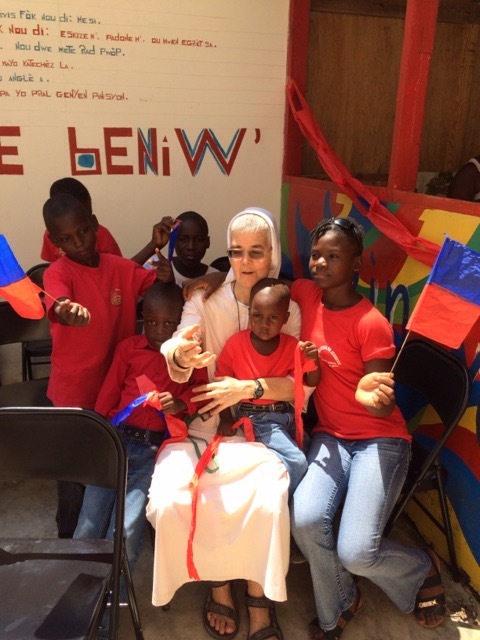 Thank you to all those who support us and accompany us in the various works of mercy that are unfolding here in Jacmel. 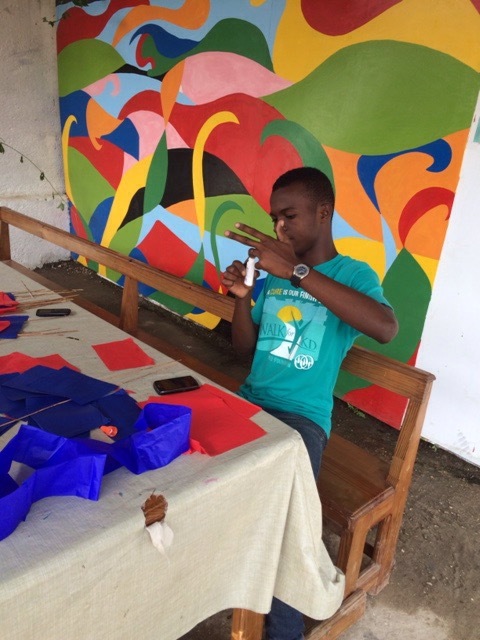 You all may remember Daniel Gedeon, the artist that we support, and who also assists us in encouraging young people to find and use their artistic talents. 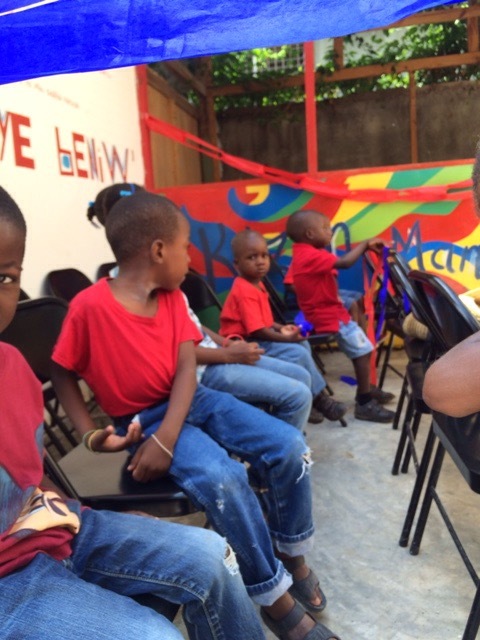 During the month of March, we took Daniel to Hospital Bernard Mevs in Port au Prince. 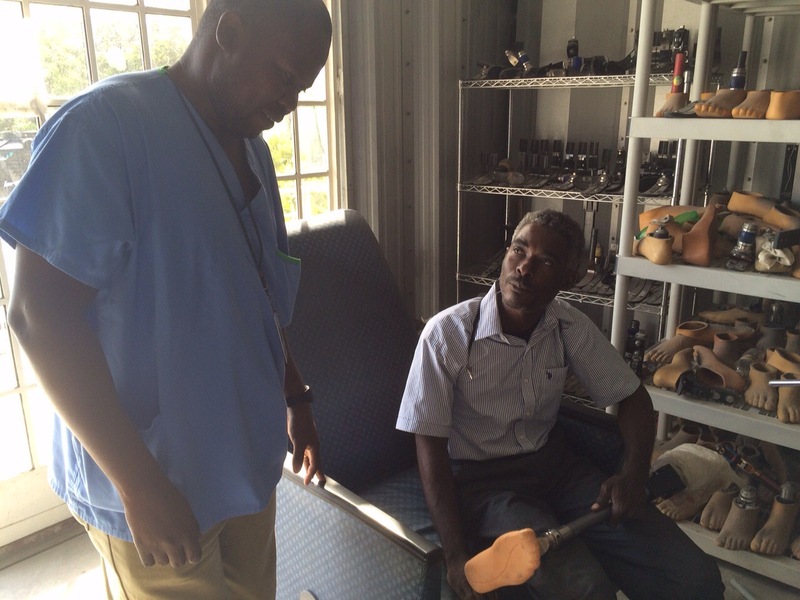 You may remember our blog in March, when we wrote about him and his story of needing a properly-fitted prothesis. Finally, on April 17, his new leg was ready. After a few weeks, he needed to return to have it adjusted. 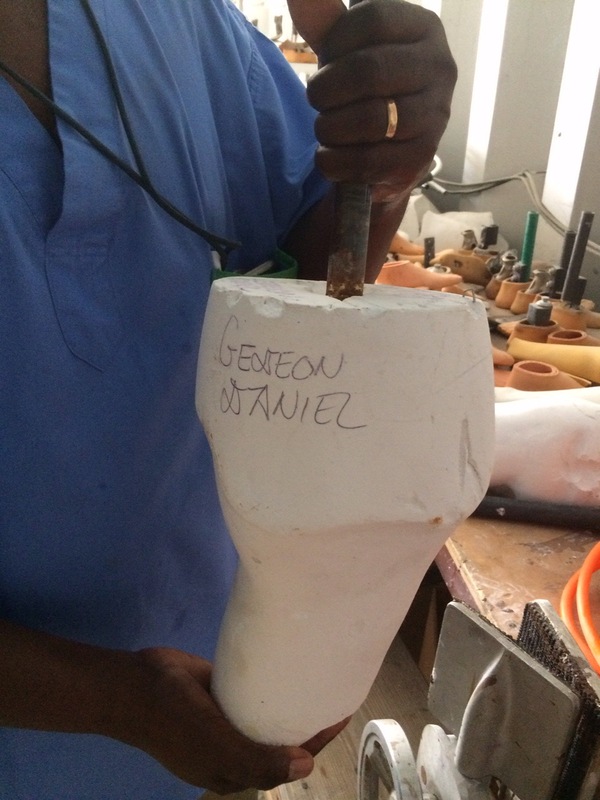 So on May 8, we made a trip to Port au Prince and now Daniel has a new, light-weight left leg. We thank Dr. Thomas Illwalla for his work. 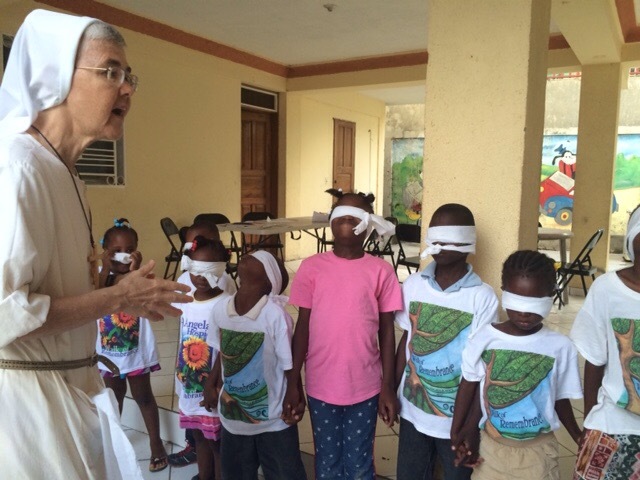 We are so grateful to the Knights of Columbus who fund this much-needed project in Haiti. 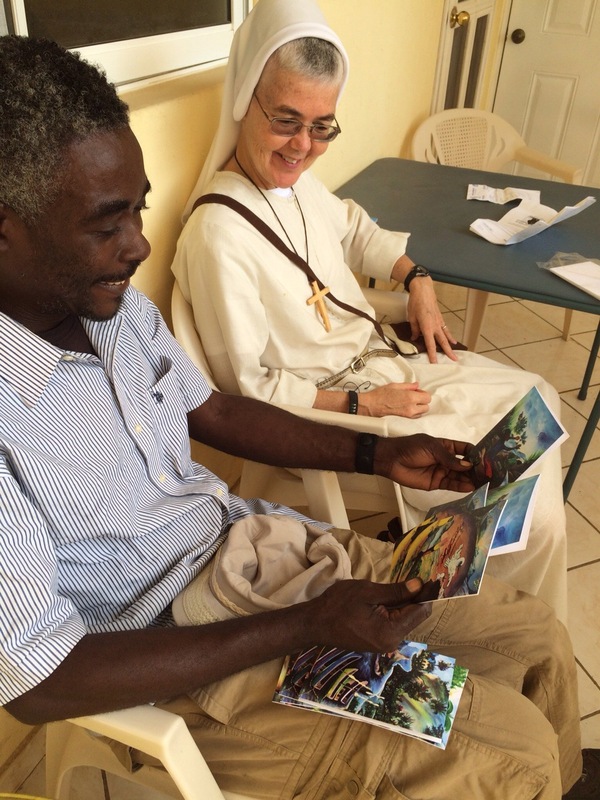 Another great surprise for Daniel was a gift from Sr. Mary Francis. She had some of Daniel’s paintings made into note cards. What a surpeise that was for him to see his artwork on note cards. These are such wonderful signs of new life! A burst of a welcome with water everywhere! 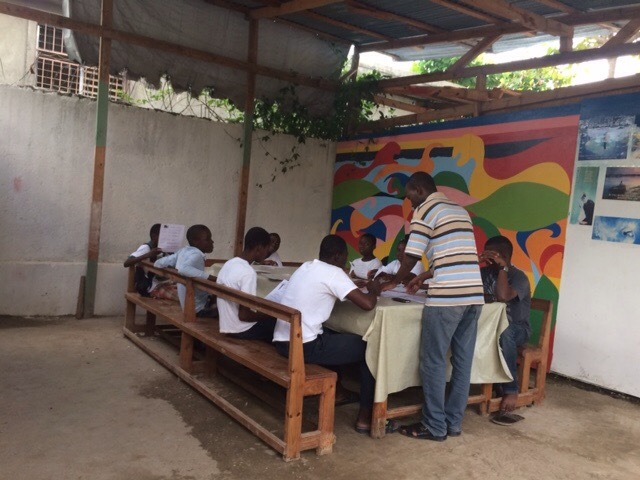 On Friday, May 1, we returned to Jacmel. Our travels were blest and it was good to be home again. On Saturday, May 2, it was time to clean our household. After unpacking our suitcases, we always put them back into our storage space that was once used by the school for bathrooms. We thought the toilets were all turned off because they have not been used these past two and a half years. But…we learned that there was another pipe, and this pipe had cracked and burst; water was everywhere! It was coming out at a strong force, like a geyser, with jets of water pouring out and flooding everywhere. Sr. Marilyn put her thumb and hand on the broken pipe to stop the flow of water as best she could, and Sr. Inga ran around to every water pipe in the house to shut them off. We did not know from where it was coming. 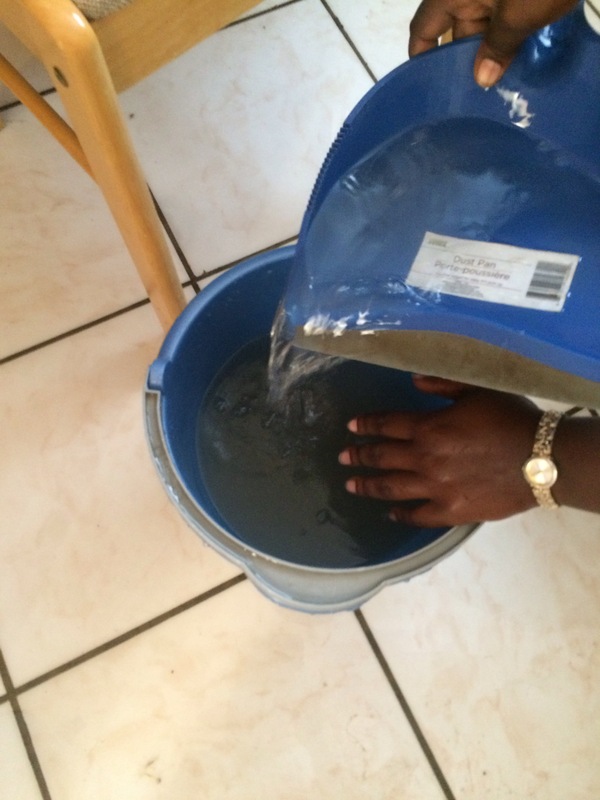 In such a panic, Sr. Inga then called our plumber, Genio, who immediately came over and shut off the main connection for all the water on the compund. 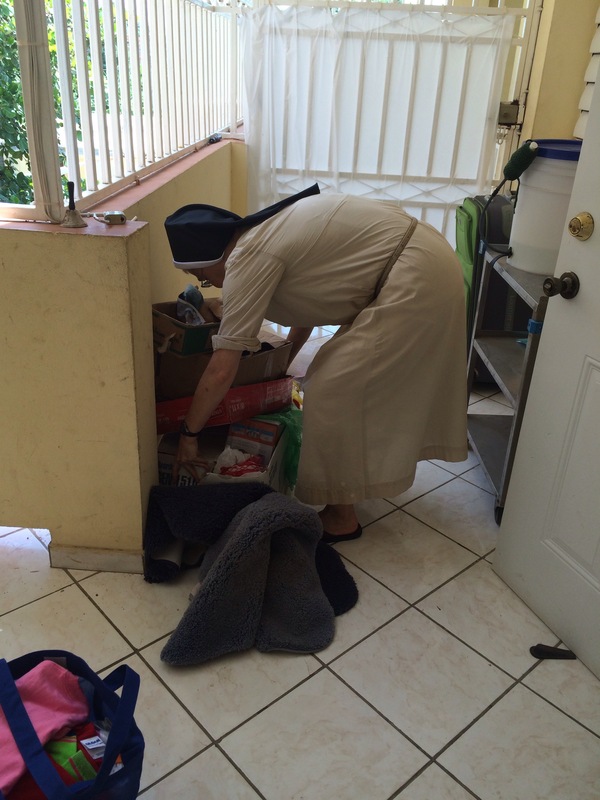 Sr. Marilyn was soaking wet, water flooded everywhere, and everything in the closets was wet. We were able to salvage some things in the boxes. 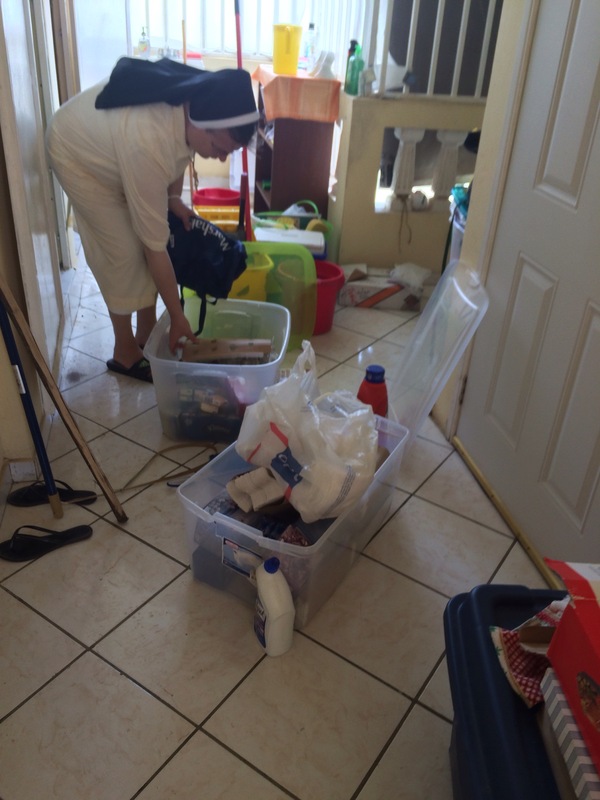 It turned out to be a full day of cleaning our closets and rooms where the water had seeped into everything. What a day! Thanks be to God we had some help from our friends!